We jump on one of the busses which pass between the Atlantis I and the C. C. Yumbo"; we're on our way to Maspalomas Faro (lighthouse), beach, and promenade. 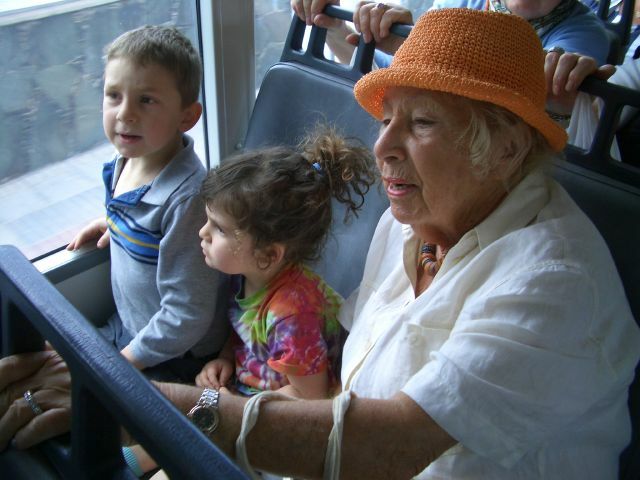 Here's Omi Marga and the great-grandkids in row 2 of the bus. It's a ten minute drive, five of which are taken with zipping back and forth within Playa del Inglés before heading to the southern edge of the island. This panoramic view is of an unusual occurance: a fresh-water pond in a sand dune, only feet away from the pounding surf. I remember swimming and playing here as a child, the sun-warmed tepid water a nice alternative to the much cooler ocean water. Things have changed, as it happens. Here's the new signage which surrounds the lake. 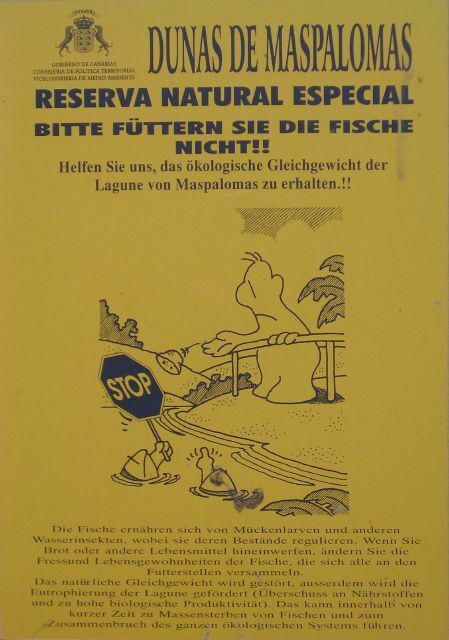 The whole place is now off-limits, a natural reserve. As happy as I am for the fish, I'm sorry that I can't swim here with the kids. 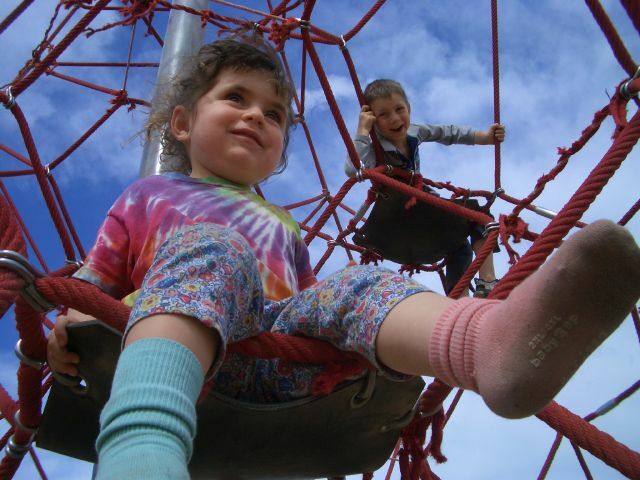 Lila has gotten excited watching Isaac ascend the climbing structure, and she demands to be lifted to one of the perches. Big brother thinks this is pretty funny. Little sister is very, very proud of her position. Don Angel recognises us, and we chat a bit before we sit. It feels so nice to be sitting here, in the warm sun, the smells of the grilling seafood in the air, a caffè con leche in front of me. The staff sees my face fall as the plates of tiny fish arrive. When I figure it out they whisk the plates away and quickly bring the grilled tiny squid and local jacket potates - papas arugadas - in a special sauce - mojo pico - to our table. Lila, who had fallen asleep before the food came, is now awake, and hungry. Seeing a bit of Isaac's pizza margherita, she wants some. 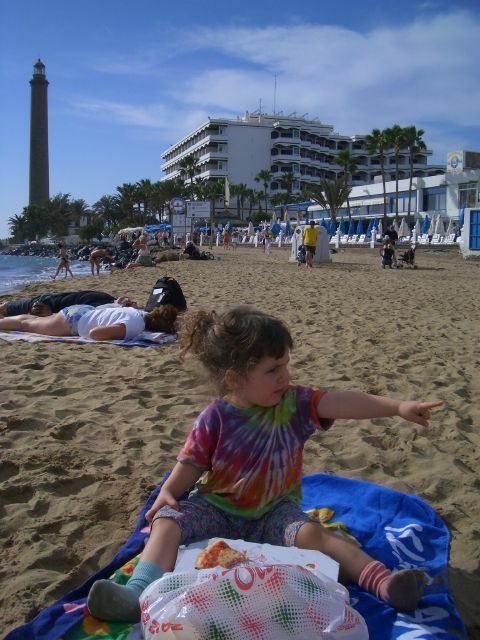 So we get one to go, and she eats it on the beach near to the Faro de Maspalomas, the lighthouse (seen here at left). Tomorrow we start with a breakfast at Finnegan's, Playa del Inglés.